If you’ve been following our blog at all, you know that we love to stretch our travel dollars so that we can travel even more! One way to stretch a travel budget is to find inexpensive lodging. Camping, hostels, budget hotels, and home exchanges are all great ways to save on lodging. Now, Airbnb.com has added a new budget travel option to the mix. Prices and availability are clearly indicated via the Airbnb website (or smartphone app), and communication between owners and renters is all done through the Airbnb interface. Budget tip: prices can be negotiable, so don’t be afraid to check with the property owner, especially if you are considering an extended stay. All of our Airbnb experiences have been great — we’ve rented condos & houses in Florida, Arizona, and New York City. Jeff’s brother also raved about his Airbnb experience — renting a private room in a large Denver apartment — and enjoying a dinner out with the host and some fellow travelers. 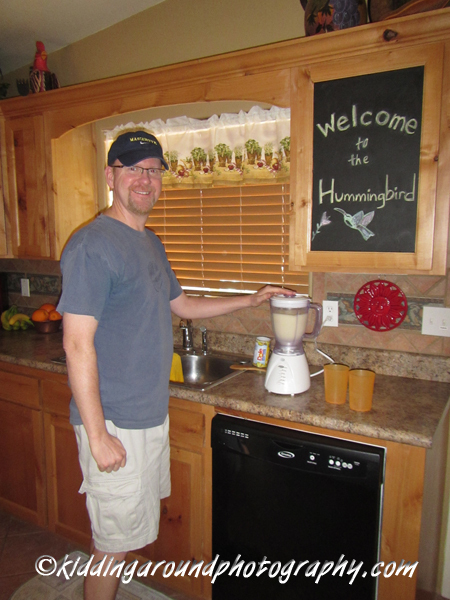 The happiest sound in the world: a blender full of piña coladas! Our most recent Airbnb rental was at the Hummingbird Casita in Patagonia, Arizona, a small town in Arizona’s Mountain Empire that’s famous for birding. The casita sits on a quiet street just one block off of the main drag, making all of Patagonia walkable from the casita’s front door. The Paton Center for Hummingbirds, run by the Tucson Audubon Society, is less than a mile away — an easy, level walk. The casita is actually a three-bedroom house with a large, well-stocked kitchen with seating for six, two bathrooms, living room with big screen TV, central air & heat, wi-fi, and laundry room. The huge master suite has a king bed, a TV, a huge walk-in closet, and its own bathroom. The second (king) and third (double & twin) bedrooms share the second bathroom, which is just down the hall from the living room. Newly and tastefully decorated in southwestern style, the casita is comfortable, quiet, and calming. Perhaps the best part of the casita is its private patio complete with BBQ grill, rocking love seat, patio table (with an umbrella! ), and a bird bath & hummingbird feeder to keep us bird nerds happy! We’d highly recommend the Hummingbird Casita to anyone looking for a quiet Arizona getaway or to any birders looking to spend some time in Patagonia. And whether you’re a birder or not, be sure to check out Airbnb before your next trip to maximize your lodging value. Have you used Airbnb? How was your experience? Leave us a note in the comments, and enjoy your next getaway, whether it’s for a week or a weekend! Note: the Hummingbird Casita gave us one free night of lodging in exchange for our review. However, the opinions expressed in this review are entirely our own. I’m going to the ALA Annual in SF in June and the hotels were REALLY expensive so I booked through Airbnb for the first time. It was so easy and the hosts have been very informative and helpful. Great idea! Have fun at the conference. We just used Airbnb for our recent AZ and New Mexico trip and I was really pleased. We’d used it once before, but after this, we’ll be regulars. It is a great way to get the most for your money and it can put you in contact with people and neighborhoods you’d never meet otherwise!